Tourmaline is a crystal silicate mineral compounded with elements such as aluminium, iron, magnesium, sodium, lithium, or potassium. Tourmaline is classed as a semi-precious stone and the gem comes in a wide variety of colors. The name comes from the Sinhalese word "turamali" or "toramalli" meaning stone of many colors. 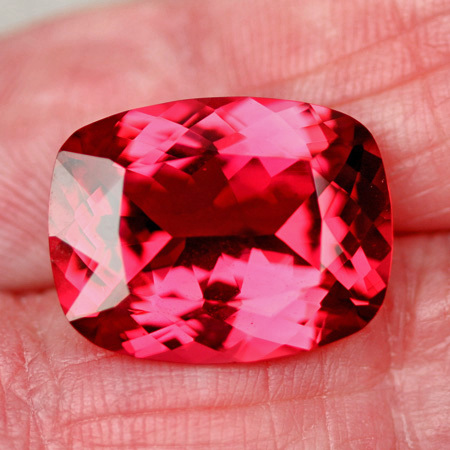 Rubellite is the red to purplish red variety of tourmaline. Tourmaline is a October Birthstone. Beautiful pinkish red color. Excellent cut and polish. VVS, almost loupe clean.